Time is flying by this year (at least for me, it is!) and summer is now officially here. July 4th is right around the corner and before we know it, it’ll be Labor Day. This year, it’s going to be totally different. Lu and I even bought beach chairs to bring to the shore. I can’t believe that I’m already announcing May’s Recipe Challenge winner from The Inspiralized Community – Lauren B! Most importantly, the June Recipe Challenge is coming to an end (8 more days) and for some reason, we only have 1 submission! Make sure to check out the June Recipe Challenge and for July, if you have any suggestions for themes, leave them in the comments on this blog post. As for the May Recipe Challenge, it was for a “Picnic Pasta or Pasta Salad.” There were so many creative submissions and I’m proud to announce May’s winner – Lauren B! 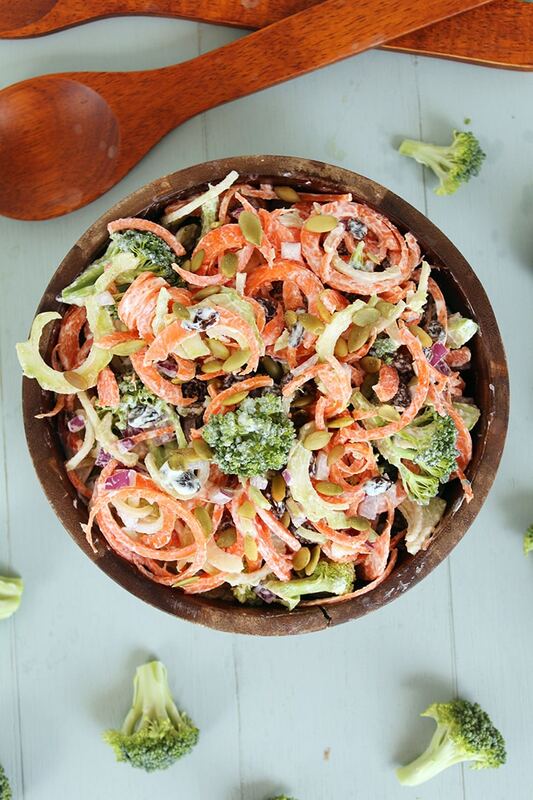 She whipped up this gorgeous Summer Broccoli & Carrot Slaw Salad. 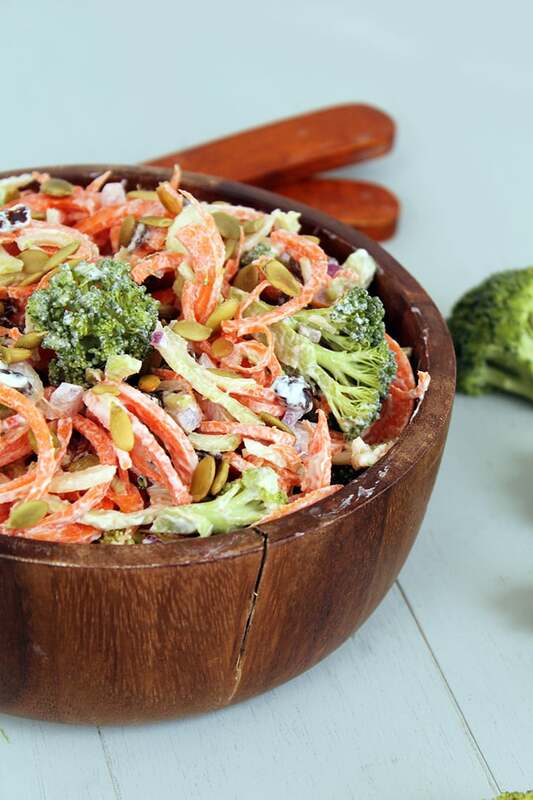 What I love most about this recipe is it’s colorful – greens, oranges, purples and whites! It’s also really simple, requires no cooking time and it’s something you can prepare and store in the refrigerator to bring to a get together. 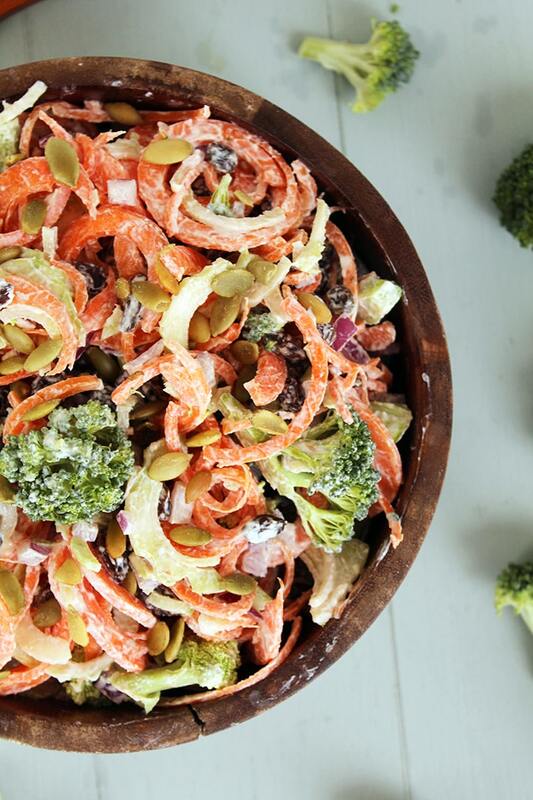 Also, it uses spiralized broccoli – something I’ve yet to post up on Inspiralized yet (coming soon.) Spiralized broccoli is tricky – it doesn’t exactly spiralize like pasta – you get a lot of half moons and broken pieces and only a few perfect spirals. Today, it works, because we’re making a pasta salad. Now, for the recipe – Lauren used PaleOMG‘s awesome recipe for a Paleo Mayo. However, I wasn’t a fan of this type of mayo (I’m not a fan of mayo in general), so I created my own non-Paleo mayo, using Greek Yogurt. If you’d like to use the Paleo version of “mayo,” you can find the original recipe here. 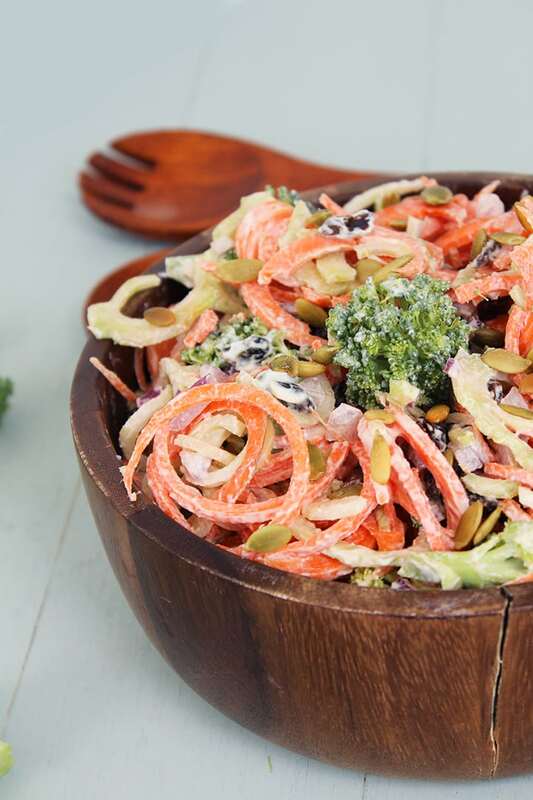 Overall, this is a crunchy, fun pasta salad for this summer that tastes even better once it’s sat in the fridge for a few hours, softening the vegetables. Thanks to everyone who participating and congrats to Lauren, who will receive Udi’s Gluten Free gift basket packed with $75 of gluten-free goodies! Remember to enter the June Recipe Challenge before it ends – join the community first, it’s free! Cut the florets off of the head of broccoli in bite size pieces, reserving the stem. 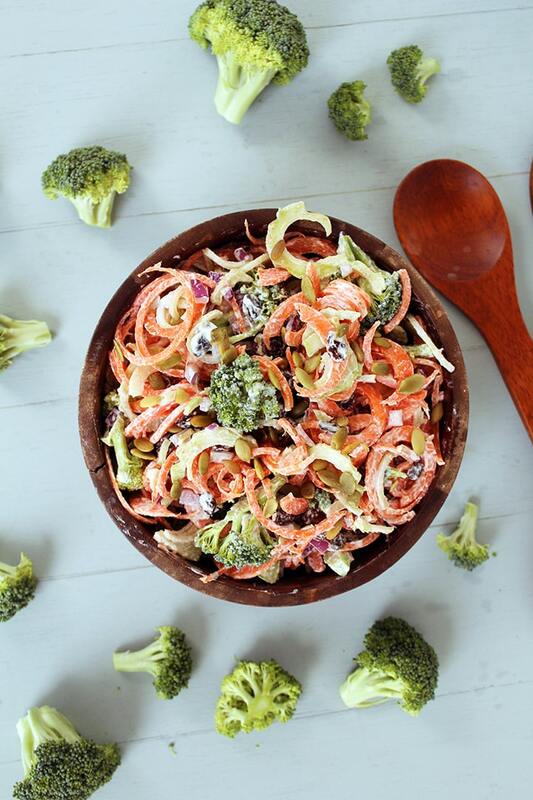 Spiralize carrot and broccoli stem, then cut noodles into smaller pieces. Place all of the ingredients for the "mayo" in a bowl and whisk together. Set aside. In a large bowl place broccoli florets, broccoli stem noodles and carrot noodles. Add "mayo" and mix until well coated. Then add in raisins and pumpkin seeds, continue to mix until well coated. Finish with a squeeze of lemon and mix once more. Recipe created by Lauren B. Looks sooooo good. Reminds me of my mother in laws broccoli salad. She puts bacon too ;) I might sneak some in this recipe. Can't wait to try this!! I like the mayo replacement with the Greek yoghurt, much healthier. I myself like a sweeter dressing so I would use freshly squeezed orange juice instead. Definitely a summer picnic addition for me. Any hints on how to spiraluze carrots?? No matter how firmly I engage the carrot in the plunger it SPINS. See my longer post below. I made this today, substituting craisins for the raisins, just because I prefer them. I also thought the mayo needed a little more "oomph," so I increased the dijon. I watched the video on spiralizing carrots. I've never seen such a huge carrot! Do you use juicing carrots? I bought the largest carrots I could find, cut off the smaller ends to use in another recipe or just for munching, and used the thicker ends. That worked! Also, the carrot juice stained the white plastic of my spiralizer. When soda and water didn't get them out, I remembered I had the piece of lemon that I'd squeezed over my salad. Rubbing the stains with the rind side of the lemon did the trick! You can find large carrots in the farmer's market or organic grocery stores! They're definitely worth it - give it another try!